Open Studio Sharing of Endling as a work-in-progress at Tanzmesse 2018. Rob and the Creative Team will work to develop Endling once again, with a focus on finalising preparations to present the work-in-progress at the renowned International Tanzmesse NWR. Rob has been granted the use of the Archive of The National Folk Theatre. He will spend time studying the resource to discovered how the celebrated theatre company has maintained it's high profile and successful creative journey portraying traditional Irish music, dance and song. Rob will be working with Dancer Maria Nilsson Waller, Vocalist Michelle O'Rourke and Scottish Gaelic Singer Alasdair Whyte to discover new means to reinvent Gaelic Song into an contemporary context, and place it upon the body. ROB HEASLIP DANCE REQUIRES MALE DANCERS FOR SPRING TOUR 2018. Rob Heaslip is seeking two male dancers to fill existing roles within his work FREAGRA | A Blurred Expanse. 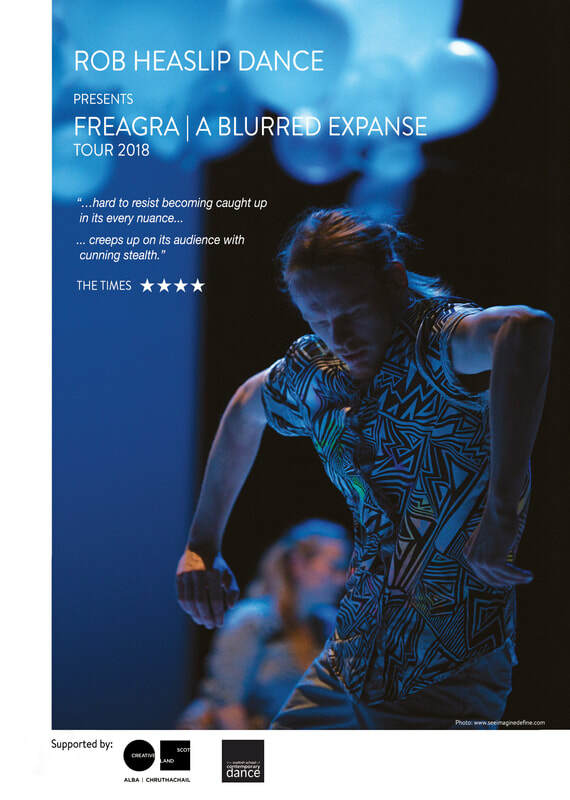 FREAGRA | A Blurred Expanse is an ensemble piece of contemporary dance exploring identity, where a focal point is conjured to create a dance piece based upon the play of cause-and-effect in human collective mentality. The work will tour Scotland nationally, and include dates in Dublin, Ireland. Rehearsals will take place in Scotland between February 12th and 25th, followed by a touring schedule between February 26th and March 27th. Both performers should have trained at recognised dance institutions. Graduates are welcome to apply. Those interested should have strong technical skills, and also hold an interest in delving into a creative process that requires improvisation, partner work, and an eagerness to work in a team environment. Applicants are required to learn pre-established repertoire, provide creative input, and deliver workshops. Accommodation and transport during the tour will be provided by the company. Performer Fee is at Equity Rates. A workshop audition will be held at Tramway Glasgow, Saturday January 13th. Invitees will attend for the entire day. Those interested in attending should send an expression of interest, a CV and a video clip to info@robheaslip.com. The application deadline is Friday December 29th. This Tour is Supported By Creative Scotland. ​We have workshops along the way for those who’d like to meet and dance with the Company – check with your venue to see when you can join us.